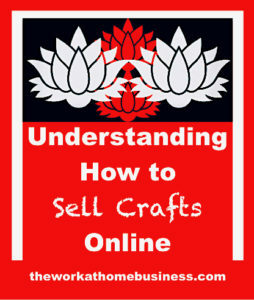 Understanding How to Sell Crafts Online for real money is a key issue for crafters. Understanding How to Sell Crafts Online for real money is a key issue for crafters. Even though there are several marketplaces to sell crafts online, it is worthwhile choosing the best ones to post your creative works. Ultimately, understanding How to Sell Crafts Online for profit links to the kind of craft you create, and the customers you want to attract. Of course these are important factors to bear in mind, so the central theme of this post is to bring to light some of the best marketplaces to sell your crafts. Important for you to realize that you should never under estimate the power of the suggested marketplaces in this post. For one thing, they offer the opportunity for you to benefit from the thousands of visitors to their websites. Undoubtedly, Amazon is huge and this company dominates the market. With this in mind, it is certainly a key marketplace to consider for selling your handmade crafts. Important to realize that to sell handmade at Amazon, there are some stipulations. Obviously, the products must be made completely by hand. In fact, the product must not be assembled from a kit. To be eligible, the products must not come from mass production, neither can they be made by different crafters. Most compelling evidence to sell on Amazon is that you have a wide selection of categories to sell in. Needless to say there are no limits to what you can create to sell. Notably, you can sell your handmade jewelry, home products like furniture, bedding for babies, lawn and garden products. In general, these are just a few samples. Specifically, as a crafter you can open your own storefront to sell your handmade craft items. Discover more right here. Another key point to note is that if you are already selling on Amazon, you can also list your very own handmade products too. To do with this you need to edit your account and add handmade. However, this is by invitation only. Discover more at this link. Additionally, you can also list your products on the other Amazon marketplaces: like amazon.ca and amazon.com.mx. In this case, there is no need for you to reapply for a new account. Even though handmade at Amazon is a different category by itself, your products will be listed among other handmade goods for buyers to purchase. Bear in mind that your profile should catch the eyes of potential buyers. Therefore, you need to let visitors know the inspiring story about your handmade crafts. Of course, use an awesome video and great photos to sell yourself. To understand more you can click this link. Watch this video for tips on how to sell handmade on Amazon. Without a doubt, Etsy has opened the door to a great marketplace for crafters. An equally significant aspect of Etsy is that there are no fees for members. Even though to join and start a shop on Etsy is free, there are three selling fees to bear in mind: “a listing fee, a transaction fee, and a payment processing fee.” You can get more information on the charges here. You pay $0.20 to list a product on the marketplace and this lasts for 4 months unless your product sells. Following that, Etsy charges a 3.5% transaction fee. Then again, you also pay a processing fee of 3.25%. Fees are payable once per month and usually they send an invoice for payment. ArtFire.com is another great marketplace where you can sell various handmade products from handbags and scarves to neckties, shoes and jewelry. Whatever your handiwork is, you can sell here. By all means, you can connect with people worldwide and associate with them. You can learn more about each storefront when you click this link. This marketplace also offer the opportunity to open a store to sell handmade crafts. A key point to note is that there are no commissions, or set up fees. However, you can open a store selecting from the 3 plans that are offered. Notably, as a merchant, you need to have a PayPal Account to accept credit card payments from customers. In case you do not have one, you can sign up for a free merchant account with PayPal on the GLC website. Starter: is $5 per month. This is perfect for those who are just starting with 1 – 50 items. Professional: is $10 per month and is the most popular plan with crafters. Ideally, you list 1 – 100 items. Elite: is $15 per month and has the benefit of unlimited items. Of course, this is recommended for crafters with numerous products. Find out more here. Hyena Cart: is a large eco-friendly marketplace. Needless to say that the products are earth-friendly and safe for the entire family to use. In other words, they are not harmful to the environment. For instance, cloth diapers and slings, eco-friendly toys and jewelry, just about any product that will not harm the environment. To open a store, you can find more information here. Hyena Cart offers the choice of sharing a store with active sellers or open your own. Generally, you do not pay to list items, neither are there any commissions. However, if your store is active, you pay a $5 fee each month. This marketplace is 100% free to open a store with them. As a matter of fact, there is no limit as to how many products you can sell. Furthermore, when you sell, you keep all your money. Shop Handmade is especially for products that you make yourself. They allow you to sell vintage items as long they are genuine. Albeit, they also allow you to sell even gently used craft items. Signing up for a store takes only a few minutes and you can it at this link. To repeat, every cent you earn is completely yours. Assuredly, your earnings go straight from customers to your PayPal account. Whatever you charge is exactly what you earn. Discover more on Shop Handmade. Check out this book for inspiration that may very well help you to sell more of your crafts. Obviously, this online marketplace is very personal. Assuredly, it is an ideal place to showcase and sell any craft item. For instance, ceramic, crochet items, furniture, quilts, woodwork. Important to note though, that you pay for listing each item. For example: if you list 25 of the same item, you pay for 25 listing. Additionally, you also pay a flat rate commission fee of 3% when an item is sold. In case you want to inspire your creativity even more, check out these books on Amazon. Great article! Just perfect for me because I’m just starting with my handmade business http://www.nordichandmade.com , so I will definitely check all these marketplaces. Thx! Glad you found theworkathomebusiness.com. Wish you lots of success with your handmade business.